Increase exterior style and interior space with the installation of quality bow windows. When you need to replace your Atlanta bow windows, you don’t have to take on the task yourself when a team of professionals can complete the project quickly with minimal disruption to your daily routine. 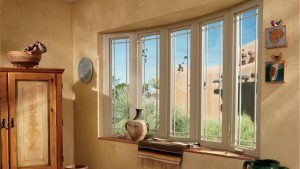 More importantly, proper installation techniques greatly improve the effectiveness of your new windows! The experts at Tight Line Exteriors have over 30 years of construction industry experience, and we go above and beyond to ensure successful replacement bow window installations. Increased Natural Light: The shape and width of bow windows allow for more natural light to come into your home. Added Curb Appeal: Even one bow window can improve the overall appearance of the exterior of your house. Additional Interior Space: Since bow windows protrude from your home, it makes the room appear larger than it really is! Greater Functionality: With the added space, you can create a bench, shelf, or storage area in the curved area of the window. Improved Energy Efficiency: New windows with better seals help insulate your home so that you can save money on your energy bills. With all of the benefits of our beautiful bow windows, don’t delay on the installation of quality replacement windows in your home! Instead, contact Tight Line Exteriors to give you the exceptional products and services you deserve. To begin the process, call us or fill out our online quote form today, and we’ll get you set up with a free, no-obligation estimate.